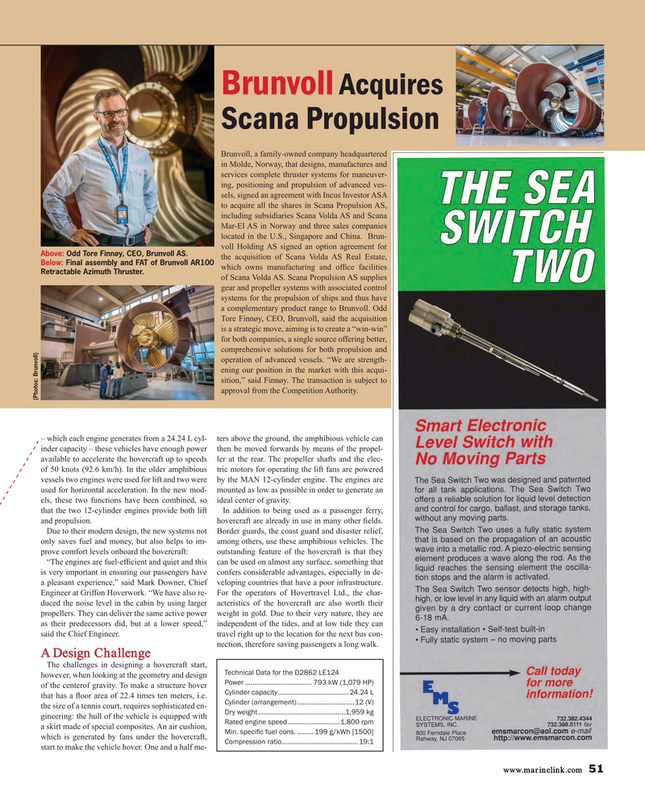 Tore Finnøy, CEO, Brunvoll, said the acquisition is a strategic move, aiming is to create a “win-win” for both companies, a single source offering better, comprehensive solutions for both propulsion and operation of advanced vessels. “We are strength- ening our position in the market with this acqui- sition,” said Finnøy. The transaction is subject to approval from the Competition Authority. (Photos: Brunvoll) – which each engine generates from a 24.24 L cyl- ters above the ground, the amphibious vehicle can inder capacity – these vehicles have enough power then be moved forwards by means of the propel- available to accelerate the hovercraft up to speeds ler at the rear. The propeller shafts and the elec- of 50 knots (92.6 km/h). In the older amphibious tric motors for operating the lift fans are powered vessels two engines were used for lift and two were by the MAN 12-cylinder engine. The engines are used for horizontal acceleration. In the new mod- mounted as low as possible in order to generate an els, these two functions have been combined, so ideal center of gravity. that the two 12-cylinder engines provide both lift In addition to being used as a passenger ferry, and propulsion. hovercraft are already in use in many other ? elds. Due to their modern design, the new systems not Border guards, the coast guard and disaster relief, only saves fuel and money, but also helps to im- among others, use these amphibious vehicles. The prove comfort levels onboard the hovercraft: outstanding feature of the hovercraft is that they “The engines are fuel-ef? cient and quiet and this can be used on almost any surface, something that is very important in ensuring our passengers have confers considerable advantages, especially in de- a pleasant experience,” said Mark Downer, Chief veloping countries that have a poor infrastructure. Engineer at Griffon Hoverwork. “We have also re- For the operators of Hovertravel Ltd., the char- duced the noise level in the cabin by using larger acteristics of the hovercraft are also worth their propellers. They can deliver the same active power weight in gold. Due to their very nature, they are as their predecessors did, but at a lower speed,” independent of the tides, and at low tide they can said the Chief Engineer. travel right up to the location for the next bus con- nection, therefore saving passengers a long walk. Cylinder capacity ......................................24.24 L that has a ? oor area of 22.4 times ten meters, i.e.